Apparently, Eric Chavez won’t be playing zombie #3 in the latest George Romero flick. With the announcement that Oakland designated Jack Cust for assignment, it appears that Chavez will take over DH duties in Oakland. Cust was non-tendered by the A’s in December, then re-signed with the club for $2.65 million in January. The 31 year-old lefty batter is coming off of a mild season at the plate in 2009, as his wOBA fell to .342 (it was .371 in 2008 and .393 in 2007). As Dave Allen noted last July, Cust expanded his zone, seemingly in an attempt to make more contact. His whiff rate dropped from the 41 percent range to 36 percent and his contact rate rose from the mid-sixties to the high-sixties, but his power suffered. After posting Isolated Power figures of .248 in 2007 and .245 in 2008, his ISO dipped to .177 in 2009. 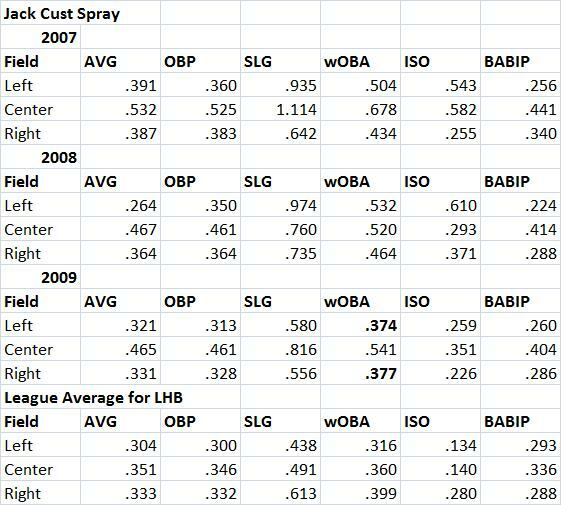 I highlighted Cust’s ’09 numbers on balls hit to left and balls pulled to the right. Cust’s opposite field hitting (.374 wOBA) remained very good relative to the league average for lefties (.316 wOBA), though obviously short of his .500+ wOBA marks on balls hit to left in 2007 and 2008. When Cust pulled the ball in ’09, his .377 wOBA came in well under the .399 league average and was a far cry from his .434 mark in 2007 and .464 figure in 2008. As for 2010, CHONE, ZiPS and the FANS all project Cust to post a wOBA in the .360 range. Considering that Cust plays defense like his cleats are made of cinder blocks (career -20.4 UZR/150 in the outfield), he’s one of the few players who holds more value as a DH than a position player. Cust could stay with the A’s if he clears waivers and accepts a minor league assignment. However, one obvious landing spot would be the south side of Chicago, where the White Sox are set to open 2010 with an underwhelming DH duo of Andruw Jones and Mark Kotsay. Jones and Kotsay project as sub-replacement-level at the DH spot, and Cust could be a two-win upgrade if he matches those offensive forecasts. Considering how tightly bunched the AL Central standings figure to be, Chicago shouldn’t let such a chance slip past them. Chavez, meanwhile, will try to pick up the pieces of a career that has been shattered by back, shoulder and elbow injuries. Entering the last guaranteed year of a six-year, $66 million deal that was entirely defensible at the time, Chavez will pull down $12 million in 2010. The memories might be hazy now, but the 32 year-old was once a force both in the field and at the plate, eclipsing the 5 WAR mark in 2001, 2003, 2004 and 2005. Chavez could be quickly relegated to spectator status by another injury, Jake Fox or Chris Carter, but it’s hard not to root for the guy. We hoped you liked reading A’s DFA Jack Cust by David Golebiewski! re: Chavez – Agreed. Chavez was such a delight to watch as the 90’s turned into the 00’s. I loved the deal the A’s signed him to at the time. It was such a welcome departure (as an A’s fan) from watching Giambi, Tejada, Hudson, etc. move on to larger market clubs. A great guy too. I hope he has a big year and justifies the Cust decision.